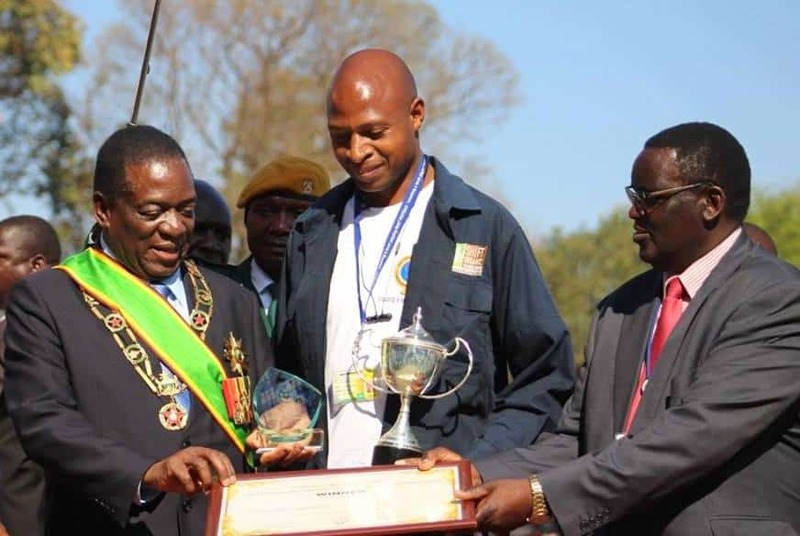 Clive Nyapokoto, founder of Shift Organics Technologies and innovator of smart farming solution Vermi Aquaponics System, scooped the Best Young Exhibitor’s Award at the just ended Harare Agricultural Show. Nyapokoto was part of exhibitors who thronged the Harare Show Grounds to showcase their various trades where he also displayed products from his Shift Organics project. Shift Organics Technologies focuses on designing smart farming solutions which include the Vermi Aquaponics System and the Talking Beehive. Speaking during the Harare Agricultural Show Awards, President Emmerson Mnangagwa who was the guest of honor expressed delight and amusement after touring Nyapokoto’s exhibition stand where he displayed various products such as fresh vegetables, natural honey, herbs and fruits all yielded from the Shift Organics projects. Under his Shift Organics startup, Nyapokoto has managed has managed to develop a smart integrated organic farming system called the V.A system Vermi-Aquaponics). It combines vermiculture, aquaponics, small livestock and Information Communication Technology (ICT). The system utilizes animal waste in the provision of nutrients for the plants and Information Communication Technology is used to remotely monitor and manage the system through any internet enabled device. Nyapokoto got assistance from paNhari in November 2014 which enabled him to upscale his project from a prototype to a large system which is currently work in progress in Marondera, Svosve communal lands. He has also implemented the same project in Mbare, Chegutu and Murewa. In July 2015 the system was among some of the top 40 innovations in Zimbabwe at the Innovation Baraza. In December 2015 the system was selected in the top 16 of agro- based innovation by the Idugu Institute. In April 2016 the Project was chosen to be part of the Zimbabwe social entrepreneurship boot camp a program being funded by the United States embassy for 6 months of intensive training on how to run social enterprises in Zimbabwe. In September 2016 he won the first prize at the Zimbabwe ICT Innovation Showcase.